Not too long ago, I read a blog post by a popular author and speaker who regularly criticizes a tradition that is not his own. Part of this particular blog post was spent in part justifying why he does this, stating that he does it to be "prophetic," to speak truth to certain elements within that tradition that need more attention in order to change for the better. For the most part, however, prophets were chosen from among the people to whom they are ultimately called to speak. Time after time in the Old Testament, God calls individuals from among the people of Israel and Judah to speak to their fellow citizens--people with whom they shared a common bond; whom they loved--about God and what it means to be faithful. They were not strangers or outsiders; they knew what their people needed to hear, what moved them, what was meaningful to them and what from their communal tradition they needed to be reminded of in order to get back on track. 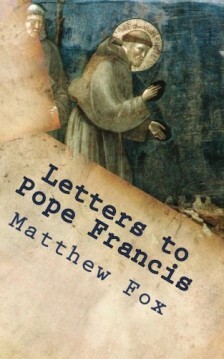 In Letters to Pope Francis, Matthew Fox, a Catholic theologian noted for his extensive work with creation-centered spirituality and former member of the Dominican Order, does exactly what the title suggests: he writes a series of letters to the newest "Bishop of Rome," in the hopes that some practices in his beloved church tradition will be transformed. And he does it by using many of the same techniques that prophets of old employed. The best way for me personally to approach this book was to think of it as being privileged enough to listen in on an important conversation. I as a non-Catholic can only hope to understand so much of what Fox was addressing. Indeed, I'm aware of some basic rudimentary information based on the news, my experiences in my Ignatian spirituality program, and my own study, but this was one real Catholic speaking to another, and it was best to honor that as one outside the tradition. Chiefly, of course, Fox has some hard things to say about the Catholic church and its conduct over the past 30 years or so. He does not seem very enamored by the last two popes, citing the slow consolidation of power in the papal office over their tenure as being incredibly schismatic, perhaps the opposite of what was intended. Through this consolidation, Fox suggests, the Catholic church has seen many undoings of the Vatican II reforms and a greater emphasis on bureaucracy rather than mission. The results have included the disenfranchisement of women and others, a preoccupation with power rather than justice, and an increased lack of self-awareness and critique, none of which are good for the the church's future relevance. To help illustrate and respond to this, Fox does two things. The first is highlighting the stories of those who have been most directly affected by the direction the church has taken. The child abuse scandals and protection of perpetrators of recent years gets heavy mention, and there is an entire chapter--or "letter"--devoted to quoting from the experiences of those who grew discouraged and left or otherwise formed their own worshipping communities. Fox also tells parts of his own story, including being expelled from the Dominican order by then-Cardinal Ratzinger for his theology not aligning with that of those in power. Fox's second method is to appeal to Catholic tradition itself. He frequently reminds Pope Francis of what his namesake stood for and what it should imply for the direction of today's church. He also appeals to the thought of Meister Eckhart--interestingly, a fellow Dominican who was persecuted by the Franciscans and condemned by the pope of his time--and to other relevant pieces of Catholic history and institutional practice. By speaking from inside his tradition and giving voice to those injured by current policies and practice, Matthew Fox follows the formula of ancient prophets in speaking truth to power. He offers praise when deserved and constructive criticism when warranted, all in the hopes that Pope Francis will continue to follow the path of reform he seems to have begun traveling. I was glad to sit and overhear this piece of what hopefully is a larger conversation happening in that tradition, as well as learn some things about Catholic history, belief, and practice along the way.